Amber, Heather, Jim and I continue on our RAKlife adventure to another one of Myanmar’s sacred places, Inle Lake. Home to a melting pot of hill tribes from the surrounding mountains, Inle Lake also will increasingly become a tourist “hot spot” due to numerous places of interest on the lake: a vast floating tomato garden, hand-rolled cigar making, lotus plant weaving, a floating market, and perhaps the most intriguing, a monastery with the promise of cats that jump through hoops! Christmas eve we find a man in town who dedicates his time and money with a group of villagers to helping various organizations around the area that support the needy. 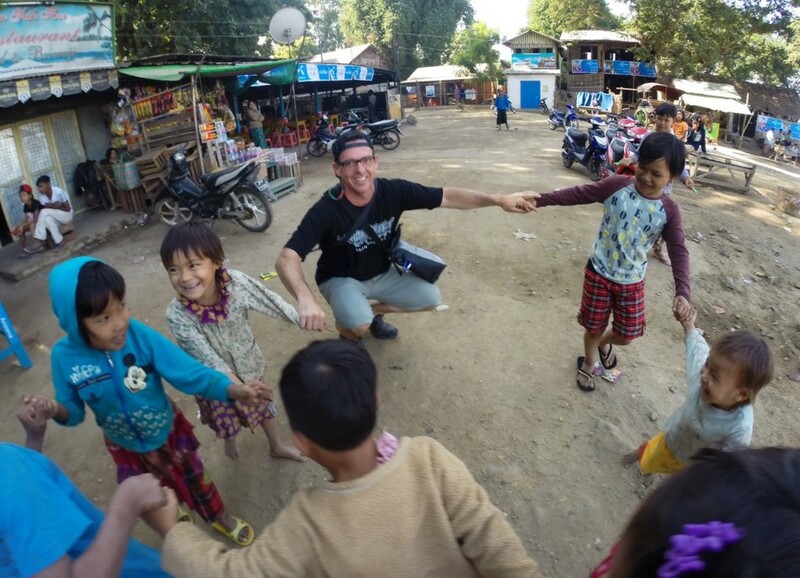 He is wary of our desire to help our the Inle Lake people, but after explaining our mission, finally he opens up, explaining that many orphanages in the area are currently sustained by foreign organizations - this is obviously a good thing. He wanted to ensure that if we were to help, that we would be helping a place with no current support. He lists one an hour bike ride from town, but warns to call the headmaster prior to coming to ensure we give what is needed, which we do. Christmas day we wake up heavy with anticipation to show the children a piece of the Christmas spirit we grow up with in America. Finding a couple toy shops near the market, we shop until we can’t fit anymore on our bikes. Naturally, we stock up on soccer and volleyballs - a staple of children’s joy around the world. Many smaller gifts like Barbies, hacky sacks, toy trucks, hula-hoops, Tetris-like hand-held games, and others fill our bags. Incredibly, we find a couple skateboards and even a gaming system for their TV. My favorite was a keyboard that included a microphone input for singing! Loaded up, we head off for our hour bike ride to the orphanage in the country. It took some effort, but we made it up the final hill and arrive to the orphanage to find the boys all waiting patiently at their desks. The girls were on a field trip to a market in the hills and would be back in a couple hours. Similar to the monastic orphanage in Bagan, the headmaster was eager to show the discipline of the children. One by one, ages 6 to 16, they stood and addressed us with their name, village, favorite hobby, what they want to be when they grow up, and closing with “it is very nice to meet you, Merry Christmas.” Adorable as anything I’ve come across in my travels. As a mathematics and engineering degree holder, it made me so happy to hear that at least 50% of the children aimed to continue on to a university and become an engineer. More impressive than the discipline to me was the lack of intolerance or acceptance seen in almost every classroom in the US. Naturally, many of the younger boys struggled to work through his introduction. Each child ages 6 or 7 had an older one sitting next to him and patiently helped the little one overcome his struggles. You could see the in the faces all the others empathizing for the child and willing him to do well. There was no snickering, no talking when it was another’s turn, and no cliques. After introductions, it was time for the fun - gathering around the table explaining that although there was enough for everybody, our desire was for the children to share all gifts. They nodded anxiously in agreement and began investigating the packages. It was quite evident that most of the gifts had never been seen by the little ones’ eyes as we showed how most of the gifts worked. The next couple hours we spent playing with the boys and the highlight for me was a 30 minute soccer game on the dirt field north of the orphanage. As we were heading out, the boys sat down again and gave us the best present of all. Several songs sung in unison to us was an amazing treat to thank us for everything. A couple were traditional Myanmar songs, however I think even One Direction would be impressed that the children sang every word to “What Makes You Beautiful.” Hands down, the best was a performance of “The Lion Sleeps Tonight,” coupled with a dance. It was priceless and if I can figure out a way to get the video on RAKlife website, I will let you all know! That night, we sit down with our hotel owner, Daniel (his English name), for our second interview for the People Project; a documentary RAKlife aims to produce which hears the voice and expresses the thoughts from the local communities that we help. Daniel grew up in Inle Lake, spent a few years in Australia, and now is back to help his family run the hotel they built in October. I will save most of the commentary for the final film, but I think it’s important to share a couple points discussed. Asked about the current government and the satisfaction of the citizens, he explains that nothing has really changed since the military government was ousted in 2010. Bhuddism has created a submissive Myanmar people, one that is content with very little and doesn’t mind status quo if they are left to live in peace. Although the pre-2010 government was run by a financially corrupt few, it wasn’t until they began the beatings and killings of 2008 that the people called for a change. Daniel states that although there is a supposed electoral process, his lingering issue remains there is no transparency given on anything - from the electoral process to where they spend tax money. He calls for a foundational right we Americans have, the right of accountability from the government to its people (another debate on the merit of the American government living up to that can be taken offline!). I ask Daniel what the hopes and dreams of the parents are for their children. His answer is beautifully simple; one that I believe will ring true as I continue interviewing people around the world- Parents want to ensure their children are raised in a safe environment and given an opportunity to succeed, whatever that may be. Anything short of those two things and parents have an obligation to question the government and their purpose for the people. We end our journey doing the little acts of kindness that we have filled our time here with between the larger acts I have written about: seeing market stall owners eating sunflower seeds so bringing them bags of more seeds, paying for somebody’s lunch here and there, tipping in a country where it is not custom, etc. No amount of kindness can amount to what we received from a country with so little. The highlight of the last couple days was exploring a random island off the southern coast of Myanmar. We stumbled across a village wedding and were instantly invited to partake in festivities and treated like the guests of honor - yet another act of kindness from the Myanmar people that we would never see in America! The newlywed couple, Aung and Myat, were so friendly to us and Jim took a few professional photographs that we will be sending to them in honor of their extreme kindness to the RAKlife team! We were able to provide many people with a brighter day and hopefully a better view of Westerners as we continue to infiltrate with increased tourism. But the universal kindness shown to us will be carried in my heart forever. Never in my travels have I encountered a society that offers to share what little wealth they have, all the while possessing a general happiness and contentment rarely seen in the everyday American. I challenge anybody reading this to visit Myanmar and see for yourself the amazing country, especially before tourism takes off in a few years. I’ll close with a simple quote recently heard that has stayed with me as I continue this RAKlife journey: “Knowing what something is, is not the same as feeling what something is.” Experience everything - you’ve only got this one life to do it. Thank you Jim Kennedy Photography for everything on this trip!